More than 1,000 people have downloaded Volunteering Qld’s new Smartphone App, Ready Qld, in the two days since it launched on 15 January. QLD Premier Anna Bligh said the free App, Ready Qld – developed by Volunteering Qld with the research assistance of the University of Queensland – would empower Queenslanders to be better equipped to work together in situations of disaster. “This App will not only inform Queenslanders about preparedness for disasters – resources, checklists and advice – but will also provide real-time updates and information about volunteering opportunities in your local area. “While our communities were devastated by the natural disasters of 2011, the outpouring of compassion was overwhelming. “Immediately following the disasters, Volunteering Qld was inundated with calls from people around Queensland and Australia. “Within three days of the floods striking Brisbane, 55,000 people had registered their desire to help. “Volunteering Qld has learnt much from the experiences over the last year, now providing better support and services for emergency volunteering,” Dragisic said. 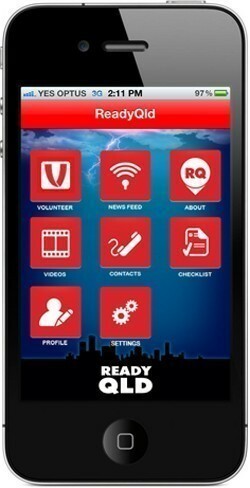 To download the App, search READY QLD on the App store or visit www.emergencyvolunteering.com.au for more information.